Paying rich tributes to the Late Dr Yashwant Singh Parmar, the founder Chief Minister of Himachal Pradesh for his role in the development of pahari states as Himachal Pradesh, Chief Minister Prem Kumar Dhumal today sought the co-operation of people for the allround development of the state. 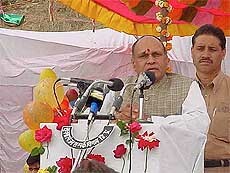 HP Chief Minister Prem Kumar Dhumal addresses a gathering at Kanjyan in Hamirpur district on Himachal Day. Retaining its hold over the Shimla Municipal Corporation (SMC) will not be an easy task for the Congress this time as the presence of a substantial number of rebels has upset the calculations of the party bosses. The SMC has been controlled by the Congress since it came into existence in 1986. In the present House, the party has 23 of the 25 councillors. Mr Sat Mahajan, a veteran Congress leader and a former PCC chief, said today that the coming elections for the prestigious Shimla Municipal Corporation (SMC) would be a referendum on the functioning of the BJP-HVC combine government. The Himachal Vikas Congress (HVC) has described the BJP-led government’s policies as “anti people”, adding that the latter has failed to implement the 1998 election manifesto. BJP dissidents of the Hamirpur Assembly segment continued their tirade against the party leadership and organised a massive friends’ meet here yesterday. Nearly 600 persons were present at the meet that was also followed by a community lunch. The TB sanatorium here is in a deplorable condition. A visit to sanatorium reveals that both official and residential complexes of this sanatorium, set up by the British in 1913, are in a shambles due to lack of repairs by the state PWD. “Leaders of the Scheduled Castes (SCs) who have been enjoying benefits of reservation and occupying high government posts should do some introspection as to what they had contributed to the uplift of the deprived and downtrodden sections of society like the SCs,” said Himachal Transport Minister Kishan Kapoor, while presiding over a state-level Dr B.R. Ambedkar Jyanti function organised by the HP Scheduled Castes and Scheduled Tribes Employees Welfare Federation and other Dalit organisations on Sunday evening. Resentment prevails among working and retired government servants who say that for past sometime their medical reimbursement bills have either been lost, or after necessary verification by the medical officers, are not traceable in the office of the Chief Medical Officer (CMO) and there is nobody in the hospital to attend to these complaints. With the melting of snow on the Pir Panjal hills in Jammu and Kashmir, bordering the district of Himachal Pradesh, security arrangements on the borders of Chamba district have been stepped up and a strict vigil has been sounded in the mountainous region of Chamba in the wake of mounting pressure on ultras in Jammu and Kashmir. Residents of Dharampur, 4 km from here, are sore over the apathy of the IPH Department to provide adequate potable water in the town. Although summer has just set in, yet water scarcity has already gripped the town, the residents alleged. The HP Primary Teachers Union today launched an indefinite stir by holding a district-level protest rally, here today. Hundreds of primary school teachers from Kangra district, took out a procession through the town raising anti-government slogans. The Planning Commission has sanctioned Rs 2 crore for the early completion of Saurabh Van Vihar, a tourist attraction centre being constructed here in the memory of Capt Saurabh Kalia who laid down his life while fighting with Pakistani intruders in Kargil. Paying rich tributes to the Late Dr Yashwant Singh Parmar, the founder Chief Minister of Himachal Pradesh for his role in the development of pahari states as Himachal Pradesh, Chief Minister Prem Kumar Dhumal today sought the co-operation of people for the allround development of the state. He said nothing was possible without the active cooperation and support of people. It was the 55th birthday of the state. It came into being on April 15, 1948, after the merger of 31 princely states. Addressing a massive gathering on occasion of the state-level Himachal Day function at Kanjyan, an interior village of the district, he said the state had made rapid strides in the field of development and was considered to be pioneer state of India. He said the per capita income of the state that was just Rs 240 in 1948 had risen to Rs 18,920 as per a report presented by the Central Government. Similarly, the literacy percentage that was 7 per cent had risen to 77 per cent in the past 55 years. The Chief Minister unfurled the national flag and took salute from the contingents of the Himachal police, the Home Guards and NCC cadets. Mr Dhumal said the BJP-HVC combine had fulfilled all of its election promises. He said the social security pension in the state had been enhanced from Rs 100 to Rs 200 per month benefiting 1.71 lakh handicapped, old and widows of the state. The wages of the daily wage earners had also been increased from Rs 45.75 to Rs 60. The Chief Minister said the government had announced many schemes for the welfare of women and under the Matri Shakti Vima Yojna 5.76 lakh women would be benefited. The government would bear the entire premium from its own pocket. He said the youth policy of the state was under formation and would be announced soon. The state government had taken various steps for the welfare of youth and the maximum age of entry into government service had been increased from 35 years to 45 years. Talking about farmers, who constituted 95 per cent of the total population of the state he said the government had formulated a crop insurance scheme on the central pattern. About 50 per cent of the premium in case of small and marginal farmers would be borne by the government. He said the sales tax on fertilizers had been abolished and restrictions on the export of khair and resin had been completely lifted benefiting lakhs of the farmers. The Chief Minister said roads were the lifelines of the state and keeping in view their importance, the government had accorded priority for the construction and maintenance of the roads. He said that 3000 km of new roads had been constructed during past four years and 3,200 km was re-tarred. To provide connectivity in the rural areas, a new scheme named as Mukhyamantri Gram Path Yojna was started this year. A sum of Rs 10 crore had been reserved under the scheme and all such villages which could not be linked with the roads would have pucca inner links. Mr Dhumal chided the Congress on the power rates. He said the government had decided to abolish winter cess and also to continue the old rates for the running of threshers in the rural areas. The main endeavour of the government was to generate 10,000 MW of power by 2010. The state government had succeeded in starting work on hydroelectric projects having generation capacity of 7,155 MW. The government was also according priority to the information technology and biotechnology in the state as both items had wider scope to flourish in this state. The Chief Minister thanked the Prime Minister, Mr Atal Behari Vajpayee for helping the state during crisis. He said Mr Vajpayee had great love and affection for the state and people of the state would always remain indebted to him for his benevolence. Mr Dhumal announced the opening of a degree college at Kanjyan and also laid its foundation stone. The college would start functioning from coming academic session he added. The Chief Minister announced that Hamirpur district had been covered under the Accelerated Power Development Programme and Rs 27 crore had been sanctioned by the Central Government for this. Under the programme all old wires would be replaced and the power supply system would become more efficient he added. He visited exhibition stalls being put up by various government departments. Retaining its hold over the Shimla Municipal Corporation (SMC) will not be an easy task for the Congress this time as the presence of a substantial number of rebels has upset the calculations of the party bosses. The SMC has been controlled by the Congress since it came into existence in 1986. In the present House, the party has 23 of the 25 councillors. However, the strength of the House has now been reduced to 24 following a delimitation of wards. The sharp division in the party over allotment of tickets has led to a good number of rebels entering the fray in at least 11 wards .The party has fielded 18 new faces and it is being alleged that at least six seats have been put at risk in the process. Not only the Congress, but the ruling BJP is also facing the problem of rebels. A minister and a local leader of the party reportedly quarrelled in a restaurant on the question of allotment of tickets. The position is equally bad in the Congress camps, which witnessed skirmishes between supporters of the two factions when the tickets were being allotted by the election committee. A leader of the Youth Congress was later attacked in the town. Keeping all this in view, a former PCC chief and a veteran Congress leader of Kangra, Mr Sat Mahajan, has been made the chairman of the campaign committee to handle the SMC elections here. He is being assisted by a sitting MLA, Mr Kaul Singh, who is considered to be as a staunch supporter of the CLP leader, Mr Virbhadra Singh. The practice in the past has been that the PCC chief steers the party in the SMC elections. It is being pointed out that only nine nominees of Mr Virbhadra Singh have been given the party ticket. However, he is under pressure to make the rebels withdraw as the efforts of other leaders have proved to be futile. It is being alleged that the camp led by the PCC chief, Ms Vidya Stokes, is talking of unity on the one hand, but on the other some supporters of Mr Virbhadra Singh have been expelled from the party on “flimsy” grounds. The example of Mr Manjor Kumar, a former Mayor of the SMC, who was expelled from the Congress a few months ago, is being cited. He is now pitted as a candidate of the Him Loktantrik Morcha (HLM) against Ms Mala Singh of the Congress in Ward No 16, consisting of the Jakhoo area. Two office-bearers of the district Congress committee are also contesting the elections as rebels. Initially, there were reports that Mr Virbhadra Singh and Ms Stokes had met at Delhi to hammer out the differences between them and chalk out a strategy for the SMC elections. It is being said that both leaders will jointly campaign for the Congress nominees in the coming days. The Himachal Vikas Congress (HVC) of Mr Sukh Ram has fielded its candidates in 22 wards. Mr Mohinder Singh, a former PWD minister who had split from Mr Sukh Ram, is heading the HLM, which has also pitted its candidates in 21 wards. Mr Mahajan, who along with a sitting MLA, Thakur Kaul Singh, was talking to mediapersons here, said Chief Minister, Mr Prem Kumar Dhumal was reluctant to accept that these elections were a referendum on the four years’ functioning of his government. He said corruption would be the main issue in the civic elections. He alleged that the SMC has been crippled by a local minister, Mr Narendra Bragta, who was ruling the roost with the active support of the commissioner of the corporation. Mr Mahajan and Thakur Kaul Singh said the proposals for development sent to the BJP government by the Congress-controlled SMC had been rejected and no grant had been provided. The OPEC funds for the sewerage project here had not been spent and the solid waste project had developed snags even before being commissioned, they alleged. They said the government had recently started some projects in the town will an eye on the elections. In a press note issued here yesterday, Mr P. C. Oberoy, a state leader of the HVC, attacked the BJP-led government for the injustice being meted out to labourers, farmers, employees and pensioners. He said the expenses of a legislator amounted to the salaries of about one hundred employees. There was a great difference what the BJP was saying and what it was doing. Mr Oberoy alleged that electricity rates were increased by about 300 per cent and the user charges in hospitals were increased manifold. Besides, rates of kerosene were also increased proportionately thereby burdening the poor masses. Mr Oberoy demanded that the government should provide relief to the farmers and orchardists of Chamba district whose crops and fruit flowers had been damaged due to the untimely rain in this region. The programme was organised by the Late Jagdev Chand Memorial Trust led by Mr Narendra Thakur, former district BJP chief. The party workers present at the function described themselves as real party persons and not dissidents. They said in fact the turncoats had occupied their position in the party but those persons would be shunted out soon. They said party leaders were surrounded by a coterie and they were not listening to the real workers. They said if this trend continued, the grass-roots party persons would be compelled to field their own persons as party candidates from all five seats of the district in the coming assembly elections. Mr Narendra Thakur, former district BJP chief, said people had realised the ground reality and they would not be misled by the false propaganda of the rulers. He said he was a loyal party man but was suspended from it as he had challenged the authority of those in power. He said he would abide by the dictates of the people, as they were the real judges. Mr Kamal Nanda, a veteran RSS man and Mr Yashwant Singh Rana, a prominent teachers’ leader also spoke on the occasion and lent their full support to the movement. The TB sanatorium here is in a deplorable condition. A visit to sanatorium reveals that both official and residential complexes of this sanatorium, set up by the British in 1913, are in a shambles due to lack of repairs by the state PWD. Almost all residential complexes are in a bad condition and are deteriorating with each passing day. The PWD, assigned to carry out the repair and maintenance, has been indifferent to numerous representations and blame the staff. The worst affected are class IV employees whose one-room set is no more better than a cowshed. Many of them put stones on the roof so that it is not blown off during strong winds. ‘‘The roof leaks after a spell of rain while the walls are on the verge of collapse, yet no efforts are being made to improve the situation’’, rues a class IV employee. The other residential complexes face the same problems and employees have to carry out repairs from their own pocket. Though the condition of six male patients’ blocks and two of female patients are far below the required standard, the situation of the Block No 2, inaugurated in November 1978 having 17 beds, is the worst. ‘‘Water seepage is a routine after rainfall and what makes the situation worse is the accumulation of water which remains there for days altogether’’, laments a patient. The electrical wiring is worn out and wires can be seen hanging. Most electric switches of Block No 2 do not work properly and even most of the tubelights in this ward have become non-functional. Most of the windowpanes are broken that allow free entry of insects into the wards. Similar is the condition of the doors that have been badly damaged. The condition of the wooden ceiling of Block No 4 is so bad and is in danger of collapsing. Ironically nothing tangible has been done to improve the condition of the building that houses the OPD and administration sections despite the fact that it had been declared unsafe by the PWD. The staff, including doctors, has left no other choice but to carry on their work from this building that has developed big cracks all-round. The old Dharamsala of the sanatorium is lying unused as its roof has collapsed. Moreover the situation at the new Dharamsala, being run by the Solan Red Cross Society, is no better due to lack of basic facilities. ‘‘The Red Cross charges Rs 10 per bed in a day for the attendants of a patients but no heed is being paid for the facilities’’, says an attendant. Only one bulb has been provided to the three rooms that create inconvenience during night, as electric switches in the Dharamsala do not work. The patient’s attendants cannot maintain any secrecy, as rooms have no internal doors. The floor of this Dharamsala, inaugurated in 1992, has been badly broken and the plaster on the walls has peeled off. Owing to lack of a fence around the sanatorium, its land has been encroached upon and a considerable portion of the donated land of the sanatorium has been occupied illegally. The sanatorium authorities are helpless to check encroachment as its land has not been demarcated reveals a staff member. ‘‘The PWD is supposed to carry on only such repairs for which it receives funds in advance’’, asserts Mr Anil Kumar Sharma, PWD Executive Engineer when contacted. ‘‘All repair work has been done by the PWD for which it received the fund’’, he adds. “Leaders of the Scheduled Castes (SCs) who have been enjoying benefits of reservation and occupying high government posts should do some introspection as to what they had contributed to the uplift of the deprived and downtrodden sections of society like the SCs,” said Himachal Transport Minister Kishan Kapoor, while presiding over a state-level Dr B.R. Ambedkar Jyanti function organised by the HP Scheduled Castes and Scheduled Tribes Employees Welfare Federation and other Dalit organisations on Sunday evening. The minister took exception to the “negative” approach of some Dalit organisations’ leaders who had criticised the state and Central governments in their speeches at the function for launching Dalit welfare schemes named after Dr Ambedkar and Guru Ravi Dass. Mr Kapoor said such schemes were meant for poor and deserving Dalits but the beneficiaries occupying government posts and those well-off should come forward for the welfare of the deprived SCs instead of criticising the government-run welfare schemes. He said the governments headed by the BJP at the Centre and in the state had given four representations irrespective of caste and creed and it was a matter of pride that the first Indian citizen, the President and first Himachali citizen, the Governor were, Dalits. Mr Kapoor claimed that there was no difference among citizens on caste lines and casteism had almost disappeared in the modern Indian society. He called upon the Dalits to be vigilant of the designs of those who intended to divide the society on caste lines and spread hatred. Mr Kapoor paid warm tributes to Dr Ambedkar and said he enriched various disciplines of life and worked for the uplift of the poor sections of society. Mr Kapoor pointed out that the Prem Kumar Dhumal government had set apart 11 per cent of current year’s budget for the welfare of the Scheduled Castes in the state. He appealed to the people to follow Dr Ambedkar’s ideals and principles in life. Following a demand from the dalit organisations, the minister promised to set up a statue of Bharat Ratna, Dr B.R. Ambedkar at Dharamsala near the Deputy Commissioner’s office. He also announced a grant of Rs 10000 to the organisers of the function on the occasion. Mr Des Raj, Gangath Assembly constituency MLA and the guest of honour at the function, urged the Dalits to give up inferiority complex and become self-reliant. Many a time, the claimants have to search for their bills themselves in the files in the CMO’s office. The bills are often found in a mutilated condition. Earlier, as a result of discussions by the Chamba Citizens Progressive Council with the CMO, a clerk or a nurse in the room of the Chief Pharmacist used to received the medical reimbursement bills against a proper receipt and after a week these bills were made available to the claimant after necessary verification by the Medical Officer concerned. This procedure worked well and there was no complaint from any side. Now, to the retirees’ surprise, this procedure has been abandoned, ex-parte, for reasons best known to the CMO and the claimants of medical reimbursement find themselves in a mess created by the department. It is humiliating and a visible harassment to the retired government servants, especially the senior citizens, many of whom are handicapped because of the age factor, and thus cannot go to the office of the CMO time and again to search and to find out the fate of their claims. Mr D. N. Pardesi, president of the Chamba Citizens Progressive Council, has demanded to provide separate counters with specified timings for attending to the senior citizens like other hospitals within and outside the state where this facility has been extended in the light of the standing instructions of the state government . The Superintendent of Police, Chamba, Mr S.R. Ojha, said here that a fresh combing operation had been launched on the alpine borderline by paramilitary forces to flush out suspected hideouts of terrorists in Jammu and Kashmir and in view of the apprehensions of infiltration during summer. The SP said the 46 Rashtriya Rifles was already camping in the Gandoh area of Doda district and 4 Rashtriya Rifles was operating in Bhaderwah zone of Jammu and Kashmir and were on the job to combat militancy, keeping in view the prevailing disturbed conditions. The SP said a team of senior officers of the security forces had recently surveyed the border areas of Chamba district and areas like Mount Tibba and Sikhari village across the sensitive Chamba border. After visiting the checkpoints of security forces deployed on the timberline and taking stock of the situation, security forces had been directed to continue anti-insurgency operations and surface patrolling to curb terrorists’ activities, the SP added. Residents of Dharampur, 4 km from here, are sore over the apathy of the IPH Department to provide adequate potable water in the town. Although summer has just set in, yet water scarcity has already gripped the town, the residents alleged. Improper distribution of water in different localities has been causing scarcity, they alleged. The residents alleged that the department had been supplying only one-tenth of the water as compared to what is had been charging from its consumers on one tap connection in a day. A written complaint had also been filed by the residents to the IPH authorities based at Solan. The residents further alleged that the situation had become worse due to handing over of the administrative related functions of the IPH Department to panchayats which were plagued by the paucity of funds and infrastructure. Meanwhile, the Solan Panchayat Parishad has criticised the decision of the state government to transfer the functioning in the hands of panchayats. Its president, Mr Ramesh Chauhan said this would worsen the situation. He also accused the department of adopting tardiness to complete some water lifting schemes. The agitating teachers, who had fixed April 14 as deadline for the acceptance of their demands, burnt the effigies of the Education Minister, Mr I.D. Dhiman, and the Minister of State for Primary Education, Mr Karan Singh. The president of the union, Mr Shankar Singh Chandel, said despite several rounds of talks and assurances by the Chief Minister and the minister concerned and secretary, their demands had not been accepted. He said their main demands included benefit to headmasters on promotion, ad hoc tenure be treated as regular service, seniority on the pattern of Punjab be given from the first appointment date, creation of separate posts of Vidya Upasaks, enhancing the pay of nursery teachers and Vidya Upasaks, teachers on contract be regularised with new pay scales , creation of post of headmaster in every school and the post of District Primary Education Officer post be reserved for promoted JBT teachers. Kulu: The Primary Teachers Federation held a demonstration in front of the Deputy Commissioner’s office here today marking the Himachal Day. Nahan: On a call given by the Himachal Pradesh Primary Teachers Federation more than 400 primary teachers from different parts of the district took out a protest march and staged a dharna in front of the District Primary Education Officer’s office here today in support of their long-pending demands. A delegation of the teachers led by its president, Mr Sant Ram Sharma, submitted a 17-point memorandum to the District Magistrate and demanded quick action on their demand charter. Agitated teachers shouted slogans and displayed banners and playcards to project their demands which included reserving 25 per cent quota in college lectureship for JBT teachers, counting ad hoc service period for service benefits as regular service, creating the post of Head Teacher in every primary school, regularising the services of contract teachers and starting nursery classes in every primary school. The rally was addressed by more than two dozen leaders and they threatened direct action if their demands were not accepted at the earliest. The Planning Commission has sanctioned Rs 2 crore for the early completion of Saurabh Van Vihar, a tourist attraction centre being constructed here in the memory of Capt Saurabh Kalia who laid down his life while fighting with Pakistani intruders in Kargil. The foundation stone of the project was laid about two years ago, but because of the non-allocation of funds by the state government the construction of the project was left half way. Later, Mr Shanta Kumar, Union Minister of Civil Supplies, had released Rs 30 lakh from his MP Constituency Development Fund. But this amount was inadequate for such a big project. Talking to mediapersons, Mr Shanta Kumar said he had taken up the issue of the project with the commission time and again. After earnest efforts the Chairman of the Planning Commission, Mr K.C. Pant, released Rs 2 crore for the project. An official communication to this effect had also been forwarded to the state government. With the allotment of the amount Saurabh Van Vihar would be completed soon and would be a major attraction for the tourists visiting the Kangra valley, he added. The local Hotels and Restaurants Association plans to organise weekend tourist events in the town for the benefit of tourists. A spokesman for the association said events like quiz contests, kite-flying competitions, roller-skating races, cultural folk dances, food festivals and talk shows would be held to ensure involvement of the tourists. Besides, the association also planned to convert the annual feature of flower shows and dog shows into tourism-oriented events by involving maximum tourists. It also proposed to conduct sight-seeing tours by the vintage toy train for the tourists and other conducted visits to nearby places of tourist interest to prolong their stay in the queen of hills. Even after three days’ recce by an Indian Air Force helicopter in the Baijnath area, the police has failed to locate a British national, Joel Kitchen, who has been missing since April 7. According to the police the IAF helicopter undertook two hours recce in the Bara Bhangal and adjoining areas at 7.30 a.m. today. There is no information about the whereabouts of the paraglider who had taken off from Billing on April 7. The police teams sent to the remote areas of Raj Gunda Dhar and Bara Gaon in the Bara Bhangal area too have also not got any success so far.